It is a pure quotation system designed to receive orders in the form of quotes. Customers can ask for a quotation for the product in the store. This quotation submitted to admin. Admin can then add/edit price for the quote and submit it back to the customer for approval. The customer gets a notification in form of an email with Quotation PDF. The customer can check the price quoted in quotation list page in My Account Section in the storefront. The customer has options to make. They can accept the quotation and place an order Or they can reject the quotation. Admin gets notified in both the cases (Reject or Accept Quotation). A quotation history is maintained on admin and catalog side both. This way quotation can be converted to order. 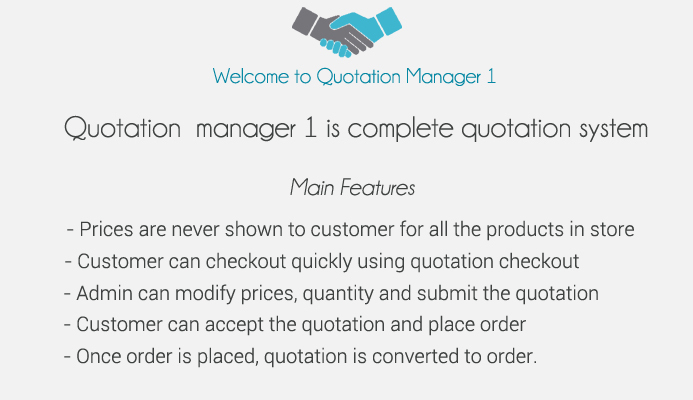 • Separate quotation page to maintain quotations list. • Separate quotation setting to work with quotation system. • Feature to set only quotation checkout. 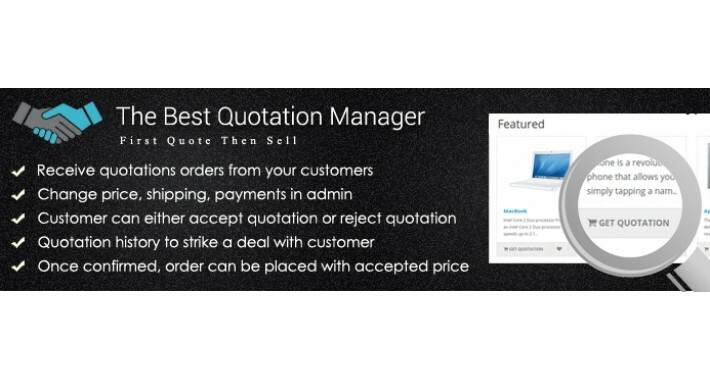 • Feature to maintain a different list of quotation status to work with quotations. • Feature to create new quotation directly from the backend. • Feature to modify price for each product added. • Feature to modify quantity for each product added. • Automatic calculation for totals on price and quantity change. • Feature to add a comment to the quotation. • Feature to show quotation in PDF format to the customer. • Feature to send quotation PDF in the email. 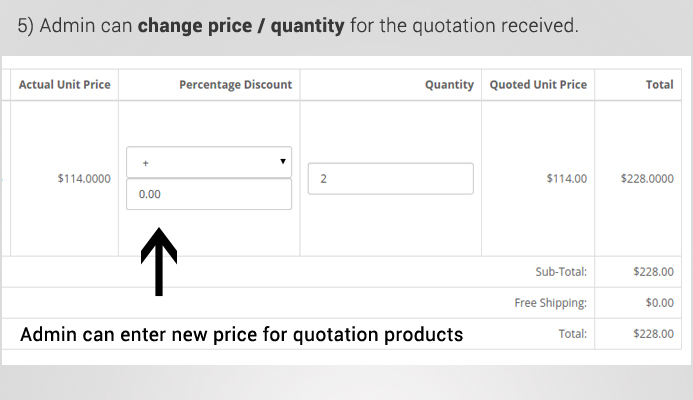 • Feature to stop a customer from viewing prices until quotation is submitted. • The documentation file is available in zip. • Adding product to quotation similar to cart procedure. • Confirm products for quotation similar to cart procedure. • The customer can checkout using quotation checkout without prices shown. • The customer can access quotation orders from header link under my account section. • Separate page for maintaining quotation list submitted in account section. • Separate page for viewing each quotation submitted in account section. • Feature to disable viewing of price/total of quotation until it is reviewed by the admin. • Feature to maintain a dealing process between customer and admin. • Feature to reject quotation and submit back to admin. 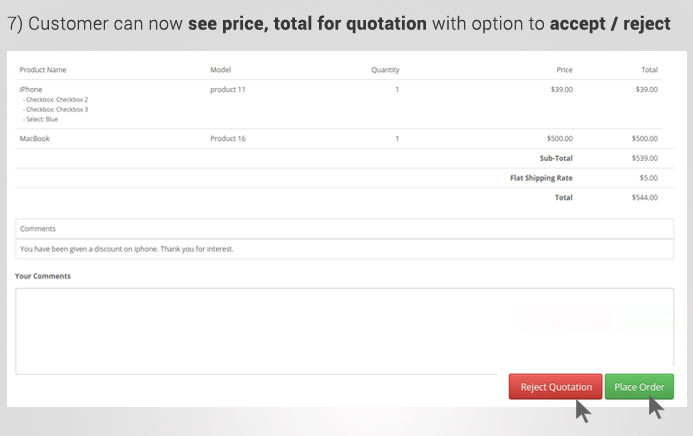 • Feature to accept quotation and place an order. 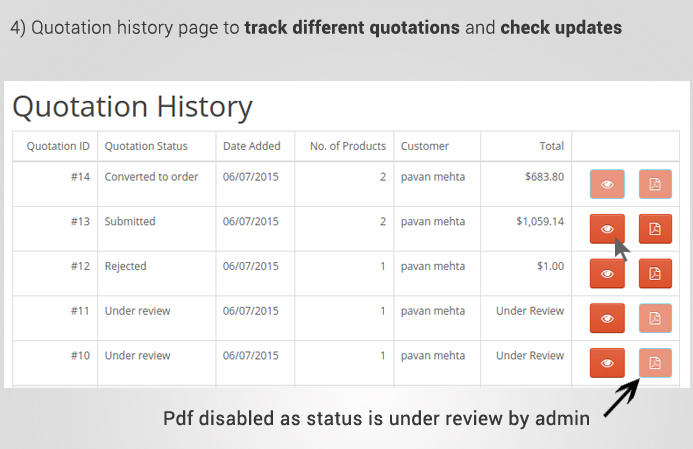 • Feature to see quotation submitted in PDF format on the account page. • Feature to see quotation submitted in PDF format directly in the email. • Feature to convert the quotation into order with same payment gateway selected. • Register users can place a quotation. 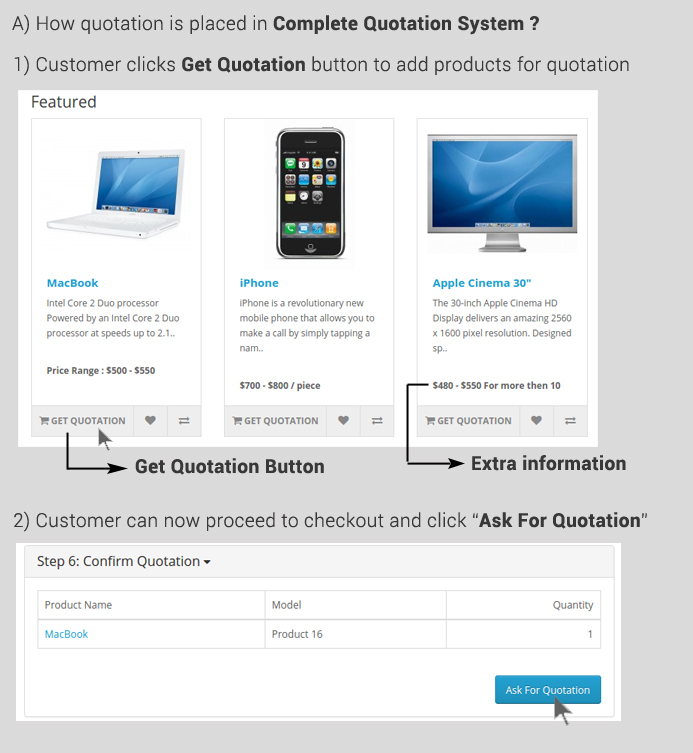 The extension is designed to receive orders in form of quotes. The customer can place an order, the price is not shown to customers. They can just add to quote. They never pay while placing a quotation. Many stores need this. There are many stores in which price is not fixed. So it is decided based on the products added. So now, customer made a quotation request. It is submitted to admin. Admin has the power to assign the prices for the products customer has submitted. Once admin assigns a price. It can be submitted back to the customer. The customer also gets the PDF Invoice of quotation in the email. In my account section in the front end. The customer can now see price given to him by admin and he can make an order with that in the opencart itself. 2) Select any products and click get quotation. These products are then added for quotation. 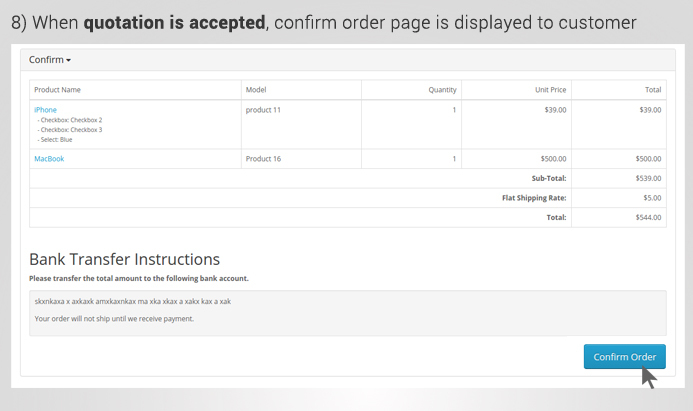 3) Proceed to checkout and confirm the quotation. 5) You will see your quotation here. 6) Click edit and to change price, quantity. All fields can be modified as per request. 7) Total & Subtotal will automatically be changed if price and quantity are changed. 8) Click save changes and then come back to quotation list page by clicking Cancel. 9) Click green tick button. This will allow a customer to see the quotation in account section. 10) You can also notify the customer about the quotation from email with pdf attached. 11) Click edit button. Change quotation status and select the option of notifying the customer. Then click save quotation. 11) You can see quotation here with pdf attached. 12) Click view button. You can either place an order or reject it. This is the flow of quotation manager. We provide free installation for quotation system. You can email us at [email protected] with order id. - Feel free to write down your feature request below in comments. - We shall look forward to it. Excellent support received. Configured the module work for my theme and also coded some additional features needed for a nominal cost. Great extension and the guys at the support always there to help you immediately. Great job. @[email protected]: Very impressed with the module. Excellent support. Would recommend this module to anyone. I just gave this extension a 5-star rating. The developer has been absolutely *excellent* to work with. After purchase, I received a friendly email from them offering to install it for me, free-of-charge. Later we exchanged a few emails about functionality plus a minor bug I'd found. The developer was very responsive at all hours of of day -- does s/he sleep? --and quickly provided an update for me to try. They'd added the functionality I was hoping for, and solved the issue. Disclaimer: This is my first/only paid extension in OpenCart so I don't have anything to compare it to. But it feels top-notch and complete, on both the Catalog side and the Admin side. Well worth the purchase in my opinion. I'm very pleased. Thank you! Congrats for your support was an outstanding experience. Highly recommended. Easy to manage and a very good user experience as well. 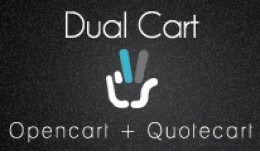 About Dual Cart - Open Cart + Quotation Cart: The extension allows you to receive quote requests for your products along with orders. 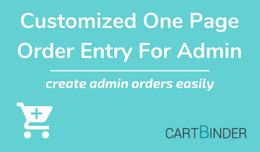 Like a customer adds..
About Customized One page order entry system is an opencart extension for the store admin to make customized orders instantly from the back end. 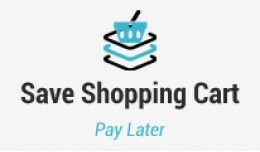 It provides ..
About Save shopping cart is an opencart extension which adds an extra feature for customers to save the cart. They can save any number of carts and check b..